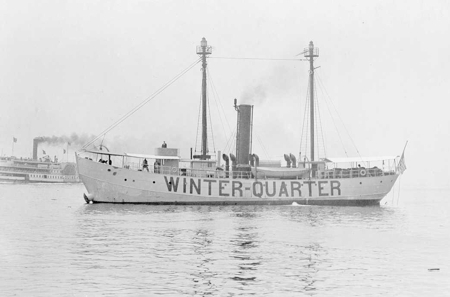 Winter Quarter Shoal Lightship – Chesapeake Chapter U.S.L.H.S. Station was located approximately 8.5 miles off Assateague Island, Virginia, 13 miles and 080 degrees from the Assateague Lighthouse. It marked the approach to the Chesapeake Bay from the north. From 1874-1875, LV24 served this station. The ship was built in 1863 by Stephen Andrews of New Bedford, Massachusetts. In November, 1875 LV24 was replaced by LV2 which had previously served on Pollocks Rip in Massachusetts. LV37 took over in 1876 and remained on station until 1888. In 1877 the ship broke its moorings and drifted down to Hampton Roads, Virginia. It returned to station under sail the following week. In 1878, heavy seas washed the spare anchor (which weighed 3,500 pounds) up onto the foredeck in the process destroying the lantern deck and damaging the lantern. From 1888 until 1908, LV45 served this station. In 1889, and again in 1896, the ship parted its chain and drifted until it was picked up by British steamers and towed in for repairs. It was relieved for repairs in 1891, 1894, 1899, 1901 and 1903, the latter repairs needed after a collision with a schooner. In January, 1908, the ship was damaged by a gale, brought in for repair and it was determined that it was too delicate for such an exposed station. It was then re-assigned to Thirty-Five Foot Channel. LV91/WAL515 took over the Winter Quarter Shoal station in 1908. Like its predecessor, it parted its chain several times (1915, 1920, 1922, and 1927). From 1934-1942 and again from 1945-1960, Winter Quarter Shoal was served by LV107/WAL529. During a hurricane in 1936, the ship was damaged by heavy seas as it was dragged off station by the storm. During WWII, the station was marked by a buoy. In 1960, the lightship was permanently replaced by a lighted bell buoy designated “6 WQS”. Photos LV91, August 29, 1923 by Jas. F. Hughes Co., Baltimore, Maryland (top) and LV45 circa 1900 scanned from th 1901 Light List, plate number XXIII (bottom).